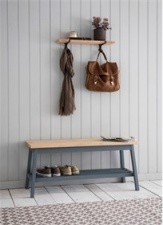 Clockhouse hallway bench by Garden Trading. Beautifully crafted in Solid wood with natural oak top and beech legs painted in charcoal. Designed with style and practicaity in mind. Wonderful addition to any hallway or conservatory. PLEASE NOTE- This item is offered with store collection. If shipping is required, please contact us directly and we will be happy to arrange a shipping quotation.